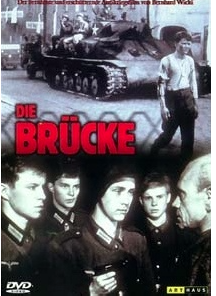 I finally got a chance to watch Bernhard Wicki’s famous anti-war movie The Bridge – Die Brücke, in which a group of sixteen-year-old high school students fights to keep a bridge. Fighting for – or destroying – bridges is one of the great war movie tropes. Unsurprisingly so, because, like hills, they are strategic points of highest importance. There’s quite a large number of movies showing battles for hills or bridges, none of these however show such a futile attempt as the one depicted in The Bridge. It’s the end of the war and the Americans are approaching from all sides. Germany, in a final, desperate attempt to win the war, is drafting even young boys. While many of the grown-ups do not believe in winning the war anymore, a group of high school students still hopes to get a chance to fight for their country. Many years of indoctrination have left their mark. They don’t listen to any of the grown-ups who want to talk them out of it. The movie takes a long time, far over an hour, to introduce us to the characters. There’s the boy whose father, a major, died in battle and who is living alone with his mother on a huge estate. There’s the boy whose father is a Nazi and who flees when he feels the end of the war is approaching, which fills his son with shame, determining him to join up. Then there’s the boy who is in love with a girl but seeing all his friends join, he cannot stay behind. There are more characters but unfortunately – and this is the movie’s biggest weakness – they are not very distinct and even look so similar that even at the end I had no idea who was who. The last half hour of the movie is the best part and quite powerful. Basically we see a series of mishaps and misunderstanding which lead to a great tragedy. Very often the defense of a hill or a bridge is the last straw and commanding officers order it in many a movie because they have no clue what else there’s left to be done. Not so here. The bridge is meant to be destroyed and the boys are only sent there to wait because nobody really knows what else to do with them. Filled with a feeling of importance and left alone by their superior officer, they think they have to fight to the last when the Americans turn up. This senseless battle costs the lives of many of the boys, of civilians, and American troops alike. Admittedly my expectations were very high, so it’s maybe not surprising they were not met. The biggest problem, as I said before, was that I couldn’t really tell the boys apart and felt they remained clichéd and flat. When a movie takes more than an hour to introduce and characterize the protagonists that’s a major flaw. The last part was powerful but the acting was over the top, so that I found it not as tragic as it should have been. It seems that this story is based on a true story and as such I think it’s a story that was worth telling, only not this way. Usually I’m not for remakes but in this case, I think it would be worth to do a remake. The story is tragic and symbolic. Better acting and better defined characters would have made this great. And color would certainly improve it. I like black and white but it must be treated differently. The images don’t have a lot of definition and depth, which may be another reasons why I couldn’t tell the guys apart. Occasionally I’m tempted to stop watching war movies. After all, it’s hardly ever cheerful. But there is a huge difference between “not cheerful” and “utterly depressing”. And while combat movie’s are rarely cheerful, they are often not utterly depressing. On the other hand movies focussing on the way common people, and especially children, are affected by war, are often extremely depressing. 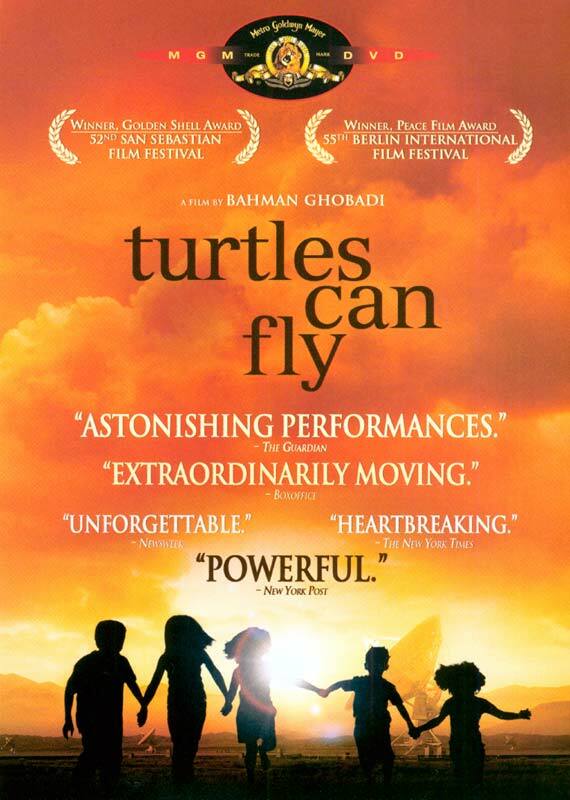 Among all these depressing movies on the fate of the civilians the Iraqi-Iranian movie Turtles Can Fly, might be the saddest I’ve ever seen. 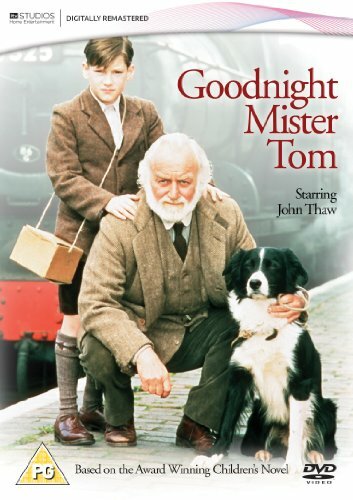 While it’s an excellent film, it’s almost unbearably bleak. The film starts with a small girl committing suicide. She jumps from a cliff. The story then rewinds and we get to know why she did it. Somewhere near the Turkish border, just before the war in Iraq breaks out, a group of people live in some houses close to a refugee camp. The elders of the village hire a young boy to buy and install a satellite dish. They want to know if war is coming. The boy is funny, entrepreneurial, and clearly relishes being the only one who knows something about technology and a few English words. He’s maybe 12 or 14 years old (sorry I’m bad at judging the age of children) and runs many small businesses. One of them consists in having other children collect mines which he then sells on the local markets. The whole area is a huge minefield and collecting them is vital because as long as they are on the fields, the farmers cannot work. Many of these children who collect mines are missing limbs from the one or the other unlucky encounter. The film maker used only children with real deformities and missing limbs which adds authenticity and makes watching it even more harrowing. “Satellite”, as they call the young boy, falls in love with one of the refugee girls. A very pretty girl who is there without parents but with her older brother who has lost both arms and a small child who has a problem with his eyes. She is the girl who will commit suicide and to learn her story was almost too much. While there are some funny scenes dedicated to “Satellite” and his business, I’ve rarely seen such a bleak movie. The poverty of these people is extreme. They live in the cold and the rain, there are hardly any trees or buildings, just some huts and tents and a lot of mud. Their situation has a lot to do with former wars. They are surrounded by danger and helpless. Without a proper system of information they are at the mercy of everyone. They never know what hits them or why. I wasn’t enjoying watching Turtles Can Fly but I was glad I did. This movie is bleak, depressing and heartbreaking but at the same time, it’s very good. The young actors are astonishing, the message is eloquently anti-war. Incendies is a Canadian French movie which has garnered a lot of prizes and nominations. It’s based on a play by Wajdi Mouawad. I found it difficult to watch. It’s disturbing and depressing. It starts with a scene in which we see young boys being shaved. It’s somewhere in the Middle East and those boys have very obviously been recruited for a war. It’s a scene that sets the tone and makes you feel uncomfortable right away. From there the movie will constantly switch between the story of the twins Jeanne and Simon, whose mother Narwal has just died, and the story of their mother. After Narwal has died the lawyer gives her children two letters. One is for their father, the other one for their brother. This information explodes like a bomb in the young people’s lives. They didn’t know their father was still alive or that they even had a brother. They have been living in Canada with their mother and the only thing they know is that she was born in the Middle East, somewhere where the frontiers are insecure and people fight for religious reasons. Jeanne decides to travel to the Middle East and look for the father. It will take a long time until her brother finally follows her and starts helping her. One of the first things we learn is that Narwal was pregnant at 20, the father of the child was shot, the baby taken away and she was bannend from the village. When Jeanne arrives in the village so many years later, she is not wlecome as she is the daughter of a woman who has disgraced her familiy. What is shocking is that despite this brutal beginning, this is nothing in comparison to what Jeanne will find out about her mother’s life later. The movie is constructed like a thriller. The two young people, with the help of the lawyer, uncover the truth very slowly. At the same time the movie tells a lot of the mother’s history in flashbacks. We know often more than the twins and they discover what we have seen, somewhat later. This may sound confusing but it’s not, it’s very well constructed and captivating. Incendies tries to exemplify that hate can only give birth to hate and that the cycle of violence and aggression is hard to break. Some of the highly symbolical images make profound statements about war, violence and fanaticism. This isn’t a joyful movie but a very powerful one. The truth the twins uncover is highly disturbing. The only problem I had is that it doesn’t choose a real conflict or country but sets the movie in an unspecified region in the Middle East. Malèna, set in a little town in Sicily during WWII, combines a coming of age story with a war-time story. The first time I watched it, it stunned me. I still liked it a lot the second time but since the story has a tragic ending, it’s more intense to watch it for the first time. Malèna (Monica Bellucci) is the most beautiful and seductive woman in the little Sicilian town of Castelcuto. Her husband is somewhere in Africa, fighting for Mussolini, while she is left behind in a very hostile climate in which all the men try to have an affair with her and the women hate her for her looks. All the men see her as an object, with the exception of a young boy who falls in love with her. We see the story through his eyes. He is so besotted with her that he follows her around, sneaks out of his house at night and spies on her. She is a favourite conversational topic and gossip and rumours follow her wherever she goes. People talk very bad about her behind her back. They call her a whore and say she betrays her husband and has lovers. Only the young Renato knows this isn’t so. But when her husband is reported dead, there isn’t any protection for Malèna anymore. She can’t find a job, she has no money and food is scare and whatever she does, the town, reigned by men, turns on her and finally forces her into prostitution. When the war is over, the women take revenge on her, not because she sold her body to the Germans but because all their husbands lusted after her. Tornatore captures the atmosphere and hysteria of an Italian city during WWII very well. How they all cheered Mussolini and pretended to know nothing of it when the Americans arrived. The hypocrisy, the paranoia, the double standards. Malèna has the extreme misfortune of not fitting in. Too stylish, too good-looking, not very sociable nor talkative. This causes the jealousy of the women who have no liberties or power and the hatred of the men who treat women like objects. This society is ruled by fanatic Catholicism and the double standards that go with it. I don’t want to give away too much but the destiny of Malèna which is extreme is very sad and to a certain extent quite typical for women during that time in Italy. Many women, especially in Italy, were forced into prostitution when their husbands were gone or dead. Malèna is an extremely esthetic movie, beautiful pictures, matching music, and of course there is Monica Bellucci whose beauty brings Malèna to life. The sexual awakening and infatuation of Renato is touching and extremely funny at the same time. It clashes with his mother’s prudery and his father’s strictness. The end of the story is tragic and infuriating.